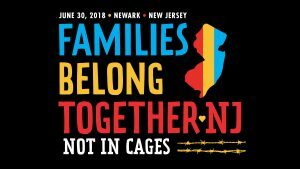 This event is organized and supported by BlueWaveNJ, Make the Road New Jersey, New Jersey Alliance for Immigrant Justice, New Jersey Working Families Alliance, Wind of the Spirit, and Women for Progress. Trump and his administration have been systematically criminalizing immigration and immigrants, from revoking Deferred Action for Childhood Arrivals (DACA) to ramping up intimidating ICE tactics. This must end NOW. WE WILL NOT ALLOW IT TO CONTINUE. On Saturday, June 30th, we will march in Newark, New Jersey, in solidarity with marches and rallies in Washington D.C. and throughout the country. Join SENATOR CORY BOOKER as we begin at Newark City Hall at 11 a.m. and march to the United States Citizenship and Immigration Services Center on Broad Street. We will tell our federal and state officials that ALL FAMILIES, at the border, across our nation, and here in New Jersey deserve to be protected. Keep up with the latest regarding the Newark march here. Help organizers get an accurate headcount by signing in with Eventbrite here. Join us to support #FamiliesBelongTogether at Rally for Humanity. Be seen. Be heard. Let our government know that cruelty to families at the US border is NOT what our country represents. 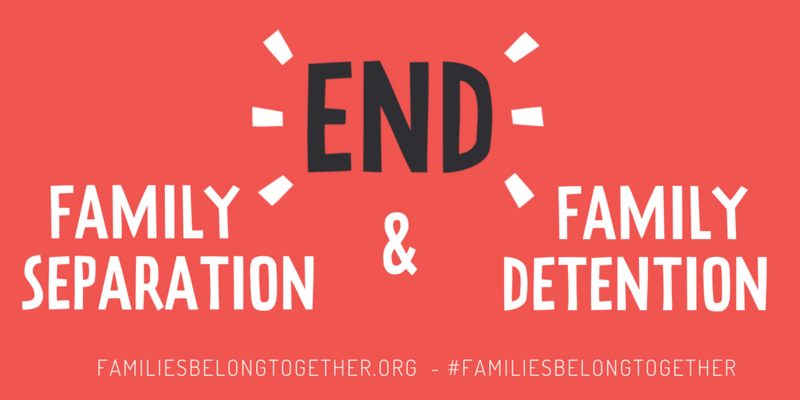 We demand that families be reunited immediately. 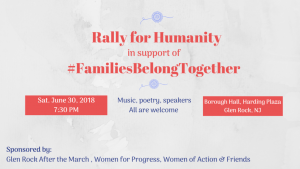 Join us for a local demonstration at Borough Hall where we will celebrate immigration, acknowledge the beauty of our diversity and share inspirational words and music. This event is FREE but we need to know how many people to expect for security purposes. All are welcome. This is a family-friendly experience. Parking: Please use the train station parking lot. No permit is needed there to park after 6 PM. The event will end around 8:30 PM. For headcount purposes, visit Eventbrite here to sign up. Keep up with the latest on this march here.